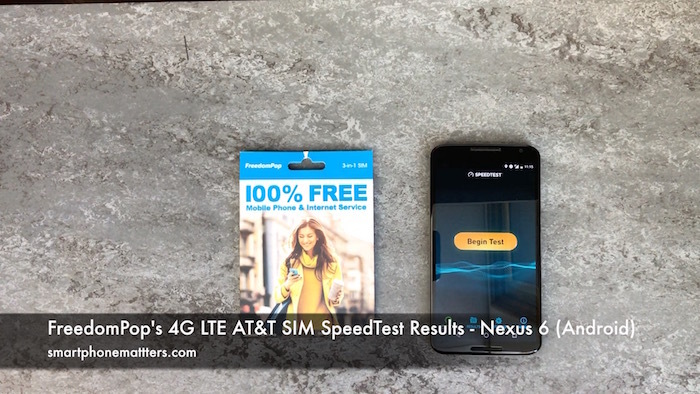 Today I decided to run some speed tests using FreedomPop’s 4G LTE SIM with my Nexus 6. I ran a total of five tests and the download speeds ranged between 4.1 and 10.4 Mbps. The upload speeds were impressive ranging between 20.2 and 22.1 Mbps. The ping times were all a little long all right around 200ms. While these results were not as good as I saw on my iPhone I don’t think that FreedomPop or AT&T are restricting the download speeds. I could be that the network was busy at the time I ran these test or perhaps my Nexus 6 didn’t have a strong connection to the network. After running these tests, I also realized I used up all my FreedomPop data and I was charged to add more to credit to my account. Perhaps I’ll run some more tests with Android in the future.